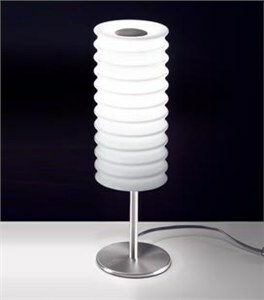 DESCRIPTION Table lamp accented with a cylindrical, hand-blown glass diffuser that is layered with a white inner layer and highlighted by crystal edges. Available in 2 sizes, this table lamp is a great accent piece or, in the larger version, a task or bedside lamp. Companion wall, ceiling, pendant, floor and other table designs are also available. CONSTRUCTION A round, painted titanium base and stem support the glass shade. A black cord exits the stem and contains the on/off switch. LIGHT SOURCE 1 x 60 watts, incandescent, A-19, medium base (provided).